Mobile robot technology. Motion control. Visual navigation. Autonomous robotics. Creation of automatic motion-control technology is the most challenging stage of unmanned ground vehicle (UGV) development. Here at SMP Robotics, we have developed and scaled to practice a motion-control technology for low-speed autonomous mobile robots. At this stage of development, the technology is perfectly suited for controlling mobile robots on unmanned territories away from public roads. The autonomous motion-control system enables the robot to travel automatically along the programmed route without operator’s input. The solutions involved allow improvements in precision and increases in movement speed with each next passage. 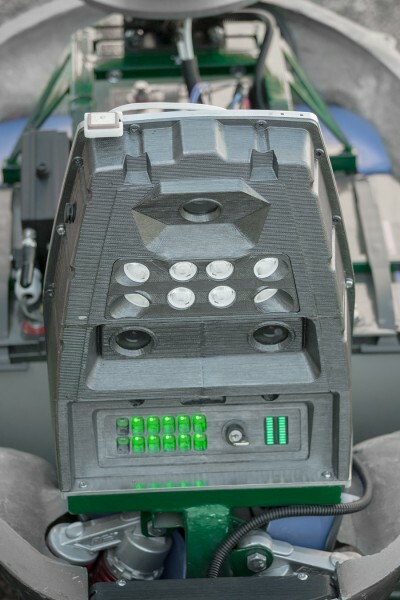 Automatic control of the robot’s travel is based on recognition of the video feed from its on-board cameras. 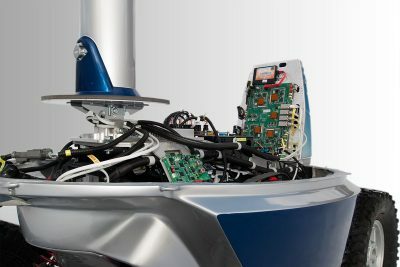 During the daytime, the robot follows visible ground marks within the range of its two cameras directed forward and backward. This method is effective for territories with large number of buildings and other artificial constructions. However, it is hardly suitable for open spaces with no clearly shaped objects. In this case, it is advised to plot the cruise routes along hard-surface pathways. The color difference between the pathway and other surfaces provides sufficient reference for route correction and precision navigation along the edge of the path. Combined with the satellite navigation system, this method enables highly accurate passages. Providing light along the cruise route by the way of street lamps is necessary for automatic nighttime motion. Standard 10 lx illumination for urban walkways will suffice. If reaching the necessary illumination level on certain segments of the cruise route is impossible, night markers should be installed. These can be attached to posts, fences, or building walls. The involved navigation technologies enable motion-control precision unattainable with GPS only and allow the robot to move in areas with poor GPS reception. The cruise routes for robots are selected on a tablet PC powered by Android. Multi-Robot software has been developed for this purpose. 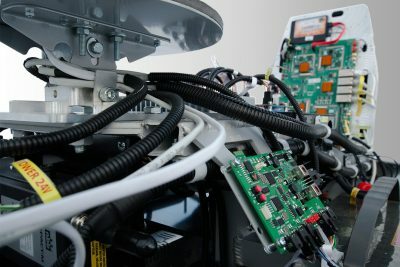 The mobile PC and the robot are connected via WiFi. 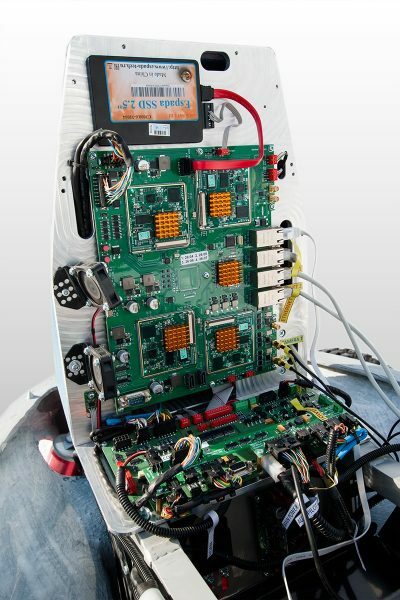 The software interface screens display the digital map with the current location of the robot, system status, battery charge, and the feed from the on-board cameras. 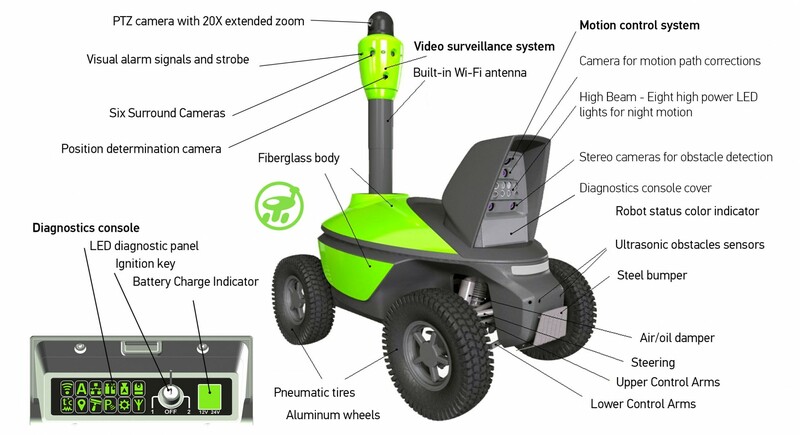 The authorized user is able to change the robot’s route, trigger the alarm and turn on the stroboscopic light, and manage the payload operating modes. The user interface software allows the user to manage several mobile robots on the same site. 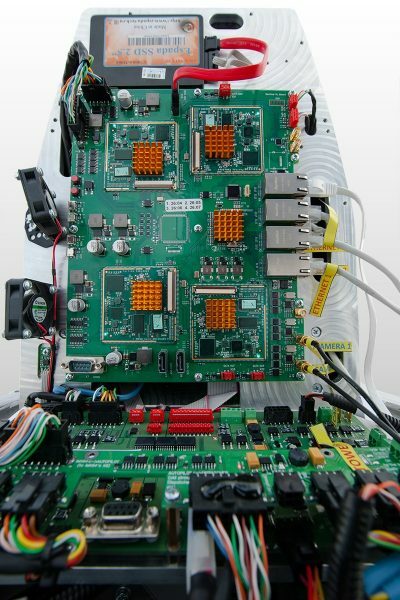 The robot’s motion is unaffected by wireless communication channel performance. 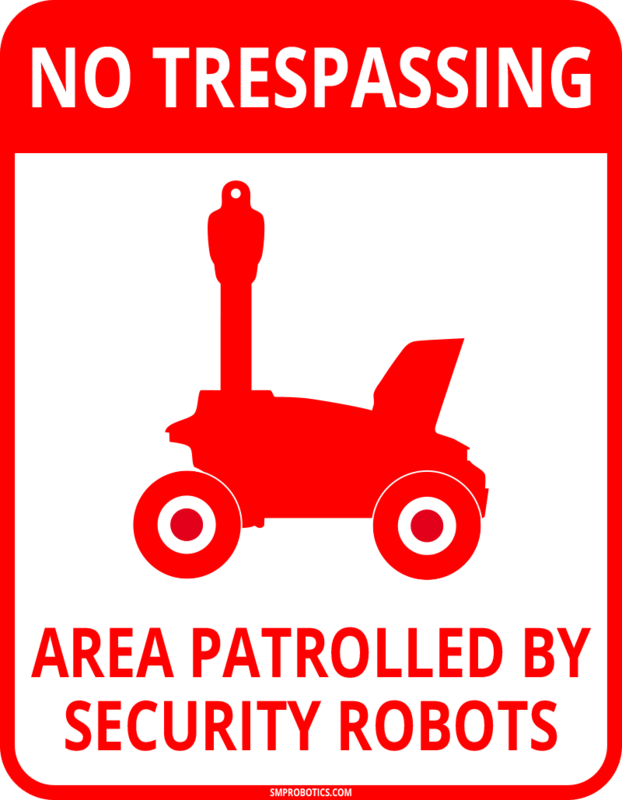 Having entered an area with poor WiFi reception, the robot will continue to move automatically until it leaves the area, and then both data transfer and video transmission are restored. Robot’s system status during operation is displayed by the built-in LED indicator with its colors clearly visible from several yards away. The color of the LED light indicates the battery charge, temperature inside the chassis, WiFi network status, and any system errors. The robot is switched on and off by operating personnel using a removable mechanical key. 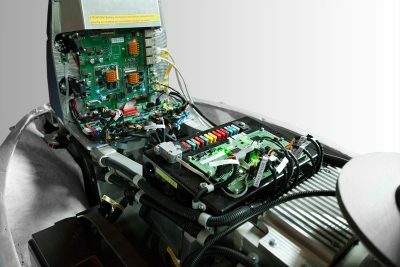 A diagnostic panel is provided for troubleshooting superficial faults. The robot is taught the cruise route during on-site assembly. A digital passage route map is created with Google Maps. Markers are placed every 50 yards along the route. Using a remote control or a tablet, the deployment/integration engineer guides the robot along all possible passage routes in manual mode. The robot records the movement trajectory, lays it over the digital map, and aligns it to visible ground marks located along the path. The operator can correct the route in order to optimize maneuverability and assign priority checkpoints. The robot is then launched on route in automatic mode in order to gather data on visible ground marks in various lightning conditions. The best result is achieved when training passes are performed throughout the daylight hours in a mix of cloudy and sunny conditions. Over the next few days, the robot will be traveling along the route in test mode. During this time, the markers remain on their places but are turned off. If the robot keeps covering the route in good time and with sufficient reliability, the markers are removed and the robot is ready for autonomous operation on this route. The robot may need to be reeducated for seasonal landscape changes like snowfall. Obstacles that occur on the robot’s path are detected by the built-in system of stereocameras. The stereo image processing algorithm calculates the distance to the obstacle and selects the ideal bypass route. In case obstacle bypass caused the robot to significantly deviate from the set route, the robot will stop automatically. 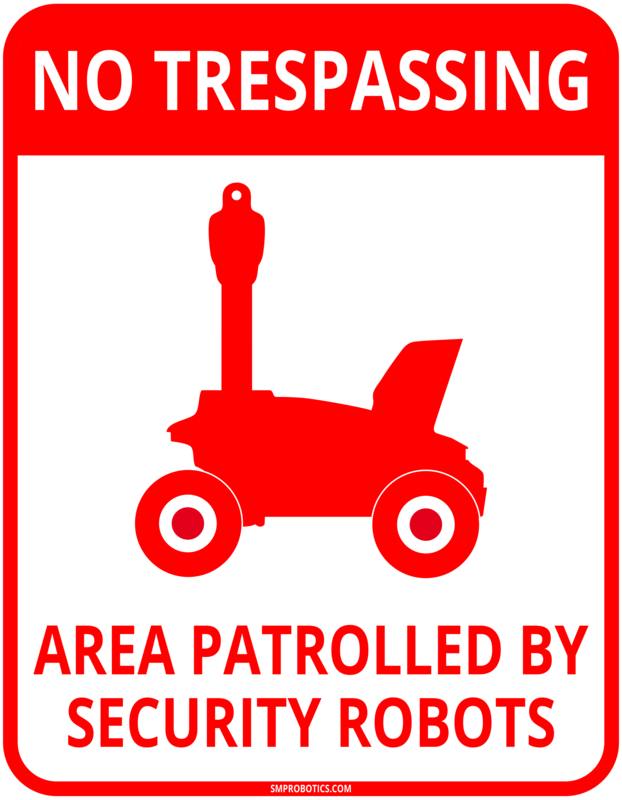 The robot’s stereocameras define the cruise route when the robot moves along a border or a solid fence. The robot is equipped with a low beam headlamp to provide for reliable operation of the obstacle detection system. The headlamp turns on automatically at twilight or when local illumination of the path immediately in front of the robot is insufficient.